Preheat the oven to 450°. In a small saucepan, melt the butter over low heat. Skim off the foam from the surface of the butter. Remove from the heat. In a food processor, pulse the bread to coarse crumbs. Transfer the crumbs to a small cookie sheet, toss with 1 teaspoon of the olive oil and season lightly with salt and pepper. Bake for about 2 minutes, until golden brown. On a large rimmed baking sheet, toss the broccoli with the remaining 2 tablespoons of olive oil; season with salt and pepper. 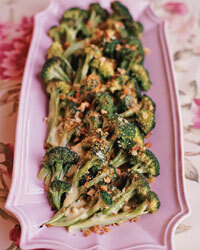 Arrange the broccoli in an even layer and roast for about 15 minutes, until just tender and starting to brown. Meanwhile, in a medium saucepan, bring 1 inch of water to a simmer. In a stainless steel bowl, mix the egg yolks with the tablespoon of boiling water. Set the bowl over the saucepan and whisk the yolks constantly until thickened slightly and bright yellow, about 1 minute. Remove from the heat. Gently reheat the butter; very gradually, whisk it into the yolks until a slightly thick sauce forms. Whisk in the lemon juice and a dash of Tabasco and season the hollandaise sauce lightly with salt and pepper. Whisk in the mint and thyme. Transfer the broccoli to a platter; pour the hollandaise sauce on top. Sprinkle with the bread crumbs and serve. Try an unoaked Chardonnay, such as one from New Zealand. Or, for contrast, look for a sparkling Prosecco, such as one from the Veneto region of Italy.